CLEMSON -- Brad Brownell’s team was searching for a resume-boosting win heading into the back end of their ACC schedule. They may have found just that as Clemson (15-8, 5-5 ACC) defeated No. 11 Virginia Tech (18-4, 7-4 ACC), 59-51 on Saturday in Littlejohn Coliseum. “Really proud of the way our guys competed. I thought our guys were a little tired today, to be honest with you. David Skara has been under the weather. John Newman has been under the weather. You could see that we just didn’t quite have some of the pop that we’ve had but I thought our guys gutted it out,” head coach Brad Brownell said after the game. Shelton Mitchell had a game-high 22 points to lead the Tigers. The Waxhaw, N.C. native hit a career-high five three-pointers in the first half. 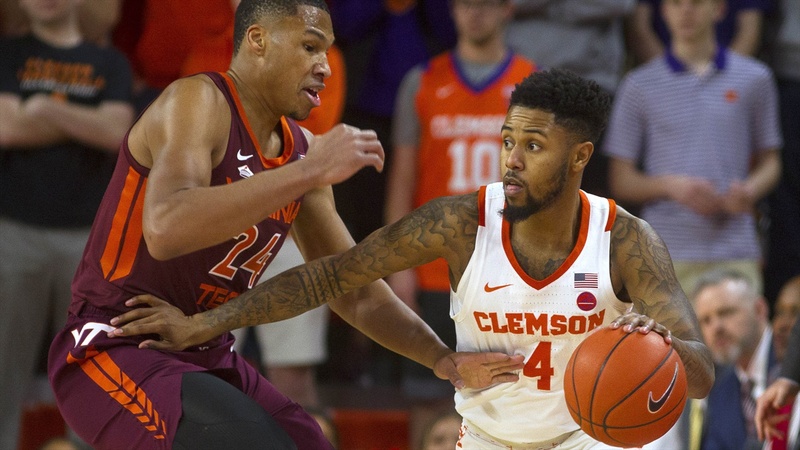 After a sluggish start from both teams, Clemson went on a 14-0 run as Mitchell got warmed up from 3-point range, forcing Virginia Tech’s Buzz Williams to call a timeout at the 12:53 mark. “Shelton Mitchell was fantastic. I thought he opened the game up for us by making threes early. His three-point shooting really helped us in today’s game,” Brownell said. Eli Thomas was big again on the defensive end of the floor gathering seven blocked shots in the contest. The past three games Thomas has totaled 19 blocks giving Clemson a large presence in the paint. Thomas also added in nine rebounds to go with six points. The Tigers took a 33-29 lead to the break and managed to hold off the Hokies over the final minutes of the first half. “Shelton Mitchell was fantastic. I thought he opened the game up for us by making threes early. His three-point shooting really helped us in today’s game. Brownell told his team that they were going to have to be “shot ready” going into today’s contest and that message was received as Clemson shot 39.1% behind the three-point line. With that narrow one-point advantage following a Kerry Blackshear Jr. jumper, Clemson received huge shots – both 3-pointers – from Reed and freshman forward, Hunter Tyson, to push the lead back to seven. The Virginia Tech offense ran into a buzzsaw as the Clemson defense frustrated the Hokies, especially in the second half. The Tiger defense held the Hokies to just 22.7% from the field in the second half. If you’re going to make a run into March, you have to defend the three well and Brownell’s group has done that over these last several games. The critical moment of this game was Tech’s Wabissa Bede missed what would’ve been a game-tying three-pointer. Six seconds later, Thomas found Marquise Reed open beyond the arc. That three-pointer put Clemson up 50-44 with 4:19 left in the game, prompting another Williams’ timeout. Later in the contest, Reed, who had a slow start, hit the game-clinching jumper with 1:07 left. Reed finished with 15 points helping Clemson to a big win. The Tigers will look for a fifth-straight victory heading down to Coral Gables, Fla. to take on the Miami Hurricanes on Wednesday. Tip-off is at 7 p.m.